Cranfield University has awarded an Honorary Doctorate to BRDC Member Adrian Reynard in the Graduation Ceremony which included the Motorsport MSc sudents of 2015-16 receiving their Masters degrees. Adrian has strong associations with Cranfield going back to the 1970s. 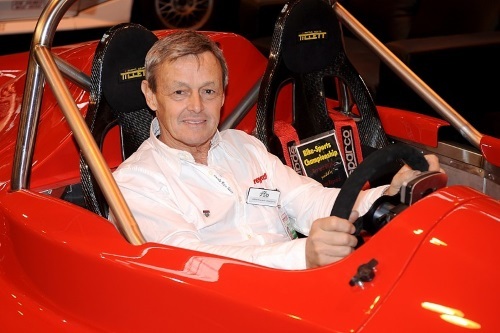 Adrian was a former student at Cranfield before going off to take up a post as the Chief Designer of an F1 team in 1975. Adrian used the University's wind tunnels to develop his designs and later executed his own wind tunnels using the Cranfield model. When Cranfield's Clive Temple proposed a Motorsport Engineering and Management MSc back in late 1999, Adrian Reynard was one of the first people he contacted to see if there was interest for a Masters. Adrian was very positive and together with other leading motorsport figures Adrian assisted Cranfield University in the design, development and delivery of the Motorsport MSc. Adrian Reynard was on the Cranfield advisory board from the start, where he was effectively number two to Sir Jackie Stewart OBE. Adrian Reynard now chairs this steering committee that focuses on motorsport at Cranfield University. Adrian makes an annual award for the best thesis project and continues to support teaching and projects. Adrian has also helped Cranfield Motorsport MSc students realise their career ambitions. Adrian Reynard joins Sir Jackie Stewart, David Richards and Nick Fry as holders of Cranfield Honorary Doctorates in relation to motorsport. For more information about motor sport at Cranfield University, please visit www.motorsport.cranfield.ac.uk.